It should be pointed out immediately that this is a reissue; the original release was reviewed on this site in 2004. Nevertheless its return is most welcome. I will declare my special interest in championing film music. 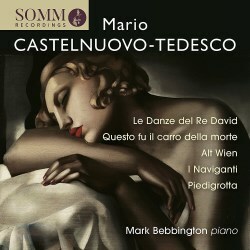 In this context it will be remembered that Castelnuovo-Tedesco was an American immigrant, escaping the Fascist Europe of the 1930s, who settled in Hollywood, like Korngold. Here he taught film music and his students included Henry Mancini, Andre Previn, Nelson Riddle, Jerry Goldsmith and John Williams. Best known for his Guitar Concerto in D, he wrote much piano music, often very challenging material for pianists. Christopher Morley, author of the erudite booklet notes (which I have shamelessly pillaged), writes that he preferred free-flowing, rhapsodic forms over – “a more rigorous sense of structure. In compensation, however, there is often a wonderful orchestral sense of colouring…”; added to which there is a marvellous sense of drama, and atmospheric and scenic evocation. The Dances of King David was composed in tribute to his Jewish faith, It carries the subtitle, ‘Hebrew rhapsody on traditional themes’ and is headed by a quotation from Psalm 37, verse 25: “I have been young, and now am old, yet have I not seen the righteous forsaken.” The work opens with the shrill linking motif likened to the sound of the ancient Biblical instrument, the shofar. The opening Vivo e tumultuoso movement is tumultuous indeed: strong, determined and authoritative yet pliable and sympathetic too. The second ‘hieratic’ dance has a flowing beauty with bell-like figures predominating after Lisztian arpeggios; it is most beautifully evocative. Savagery comes next with an almost Rite of Spring intensity. This is followed by the sinuous, sensual, perfumed music of the fourth dance, gorgeously ecstatic. Proud, martial-like music follows and then comes the ethereal beauty and the sweet swaying melody of the ‘melancholy and supplicatory’ sixth dance. The whole is rounded off with ‘fast and warlike’ material. Questo ful il carro della morte (‘This was death’s chariot’) takes its title from a passage in Giorgio Vasari’s Vita di Piero di Cosimo. It is a dramatic, macabre piece beginning quietly, solemnly in dotted rhythm but moving inevitably through fanfare figurations and three-octave surges and quasi-orchestral tremolandos as the chariot moves inexorably towards its horrifying journey’s end. In association, I Naviganti expresses the same sort of idea but this is a quieter more acquiescent picture of sailors attending the cadaver to the isle of the dead. Sunnier vibrantly coloured music pervades Piedigrotta, a Neapolitan rhapsody. It is full of light, exuberance and emotion “depicting the life of a district in Naples where religious feast-days are celebrated with sentimental panache.” The opening ‘Tarantella’ is exuberant and vivacious with some impressive coruscating runs and interesting accents. ‘Notte é lune’ is a gorgeous, gently rippling moonlit dream, ‘Calasciunate,’ depicting the sound of an ancient, guitar-like folk-instrument, is fun, skipping and rollicking along and ‘Voce luntana’ is a setting of a popular Neapolitan song that simply haunts. The final ‘Lariulà!’ gives the impression of an approaching marching band to bring the collection to a high-spirited end. Very colourful and evocative piano music that is heartily recommended.